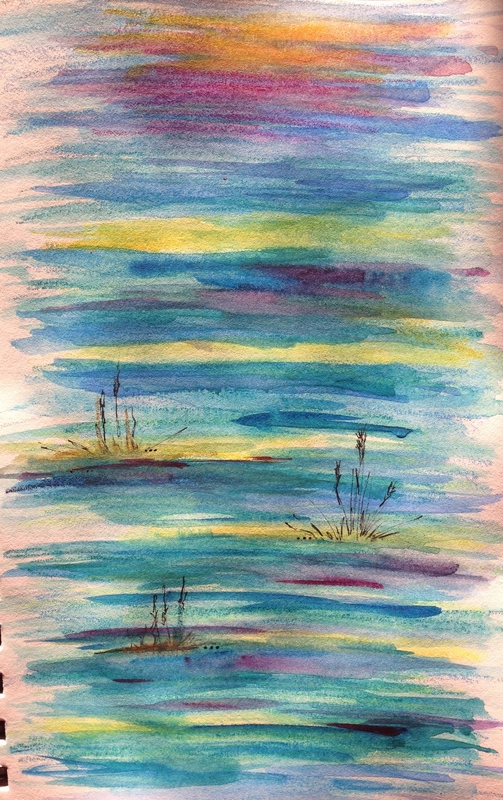 And really wishing I had a whole bunch more of those Neocolor water soluble crayons. With watercolor paint, they make a dreamy pair. Not barely into September, and I’m starting my Christmas list! hehe. Happy, peaceful, water lily on a still pond Wednesday to all of you today. < Draw A Bird Day (September encore)! Oh those colors are absolutely beautiful and peaceful Laura. Stunning! Thanks! Nice to get your initial impressions also. Much appreciated! It’s cool to see what the viewer sees when looking at my abstracts. Boy, I can’t wait for fall, hopefully later this week. I think there is probably a whole school of thought who keeps the lips zipped for that reason, and I can see it. I’m not inclined to say much until someone tells me his or her impression, because I don’t want to skew their perceptions before they’ve voiced them. Have you ever read Murakami? I’m pretty sure he’s that way …. won’t really interpret his work for people. And there is a cat in every story! Yes I love Murakami. My (younger) daughter turned me on to him. Peaceful and meditative color today Laura. Thank you for sharing. I’ve got my knitting basket out and I’m making fingerless gloves for the kids in my clan for Christmas. It’s coming fast. Thank you Kirk. Does it give you a peaceful feeling? Actually, not so much peaceful as movement or move forward. I think this is one of my favorite things you’ve done. Thank you! Move forward. I like that interpretation. I would love that as a title for this piece! If I were a rich guy, I’d consider buying this one. awwww…..you wouldn’t have to buy it, if I could recreate it. This one is in my journal. Would be cool to try making something like it, but larger. I actually thought it might only appeal to me! I’m glad to see it has broader appeal. Thanks for that. The Neocolors are really what made this one. Pretty colors and lines. I wish you’d post your work larger, because larger I can really see the individual color strokes and subtle blends which are lovely, Laura. Thanks C. You are the queen of the digital age! I wouldn’t even know how to do that. My scanner is great for the office and horrible for artwork so I take pictures with my iPhone for posting. No idea how to make it larger. I appreciate your sweet compliment! Oh, it’s easy to make larger. When you click on the image after you put it in your Media File and insert into the post, you can edit the photo and click large or custom or full size. I will try it and let you know if I was able to do it! Thanks, C! I’ll just edit this one…. That was so easy, thanks! I changed it to “large”. It feels really huge to me now, though. Do you like it? Yes, and thank you!! C, where do you learn about all the digital stuff??? Can you recommend a book, or are you one who can just figure this stuff out by playing around? Ooh, I’ll try that custom one, thanks! Changed it yet again. Thanks C! Stunning colours and a sense of calm comes over me looking at this Laura, so beautiful. It’s beautiful! Have you tried the Lyra watercolor crayons? A friend said she loves hers and they are cheaper than the Neocolors.. Thanks Kari! I haven’t tried them but I will now! Thanks for the tip. I feel like I’ve tried their colors pencils and really liked those. Lots of beautiful interest points in this piece Laura – I like it a lot. The swish of lines gives it a nice evenly energetic flow, while the sprits of grass gives the eyes a nice break. Cool one! Thanks, Mary! I really appreciate your generous feedback, as always. Lately I’ve been trying to create peace and happiness in my artwork without thinking about much else at all. I’m glad it’s connecting to people and making them feel peaceful or just happy when they see it. Have a great rest of the week! Isn’t that what art is all about ~ awesome Laura!